Aloha – greetings from sunny Wakiki! DOTW is on location this week scouting out some of the best drinks in Honolulu. So far, we have managed to have some great drinks at Duke’s, Lewer’s Lounge and Room Without a Key. 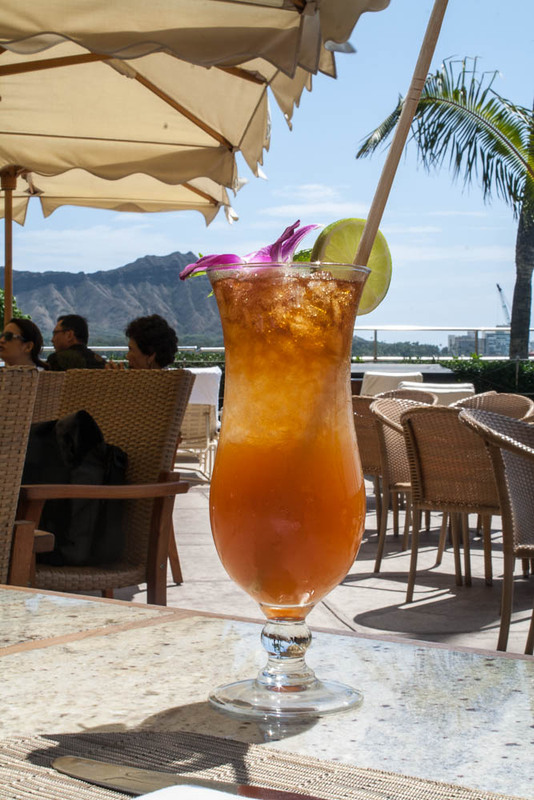 This week’s drink of the week was invented at the Hilton Hawaiian Village in 1957 by it’s famed bartender, Harry Yee. Mr. Yee was also responsible for another tropical favorite, the Blue Hawaii. While Mr. Yee may have invented the Tropical Itch, and they are mighty fine over at the Hilton Hawaiian Village (this isn’t our first visit), they have perfected down the beach at the Halekulani. Sensing the onslaught of the cocktail craze, the Halekulani brought in the incomparable Dale DeGroff to perfect the Hawaiian classics and invent cocktails that will soon join the list of Hawaiian classics. Given the heritage of the Tropical Itch and it’s perfection by Mr. DeGroff, we have made the Halekulani’s Tropical Itch, the drink of the week. Aloha! Combine in a shaker with a cup of ice. Pour, with ice into a double old fashion or collins glass. Top with additional passion fruit juice if needed.